What the average visitor to a museum or art gallery sees on display is usually just a fraction of the immense collections that the facility holds in its archives. In some cases, just 2-3% of a museum’s entire collection is on display. So where’s the rest? The majority of a museum’s exhibits are typically buried deep within the core of the building in hard-to-access storage areas or, in some cases, at a different facility altogether. Lack of access to important exhibits is increasingly being recognized as a problem for museums and, in what has become known as the open culture movement, more and more galleries and exhibitions are calling for important materials to be more readily accessible to the people who venture to a museum in the hope of viewing something specific. But just how feasible is this? Can museum staff access vast storage areas to provide visitors with access to one single item? This is the future of Museums. The future museums and galleries will rely on organized, effective storage systems that allow curators to access stored materials and artifacts in a quick and efficient manner. Display more items from your collection by using high-density mobile storage systems that make full use of the space available through removing the need for aisles. We offer a range of shelving solutions that can be adjusted to your specific needs. For example, if you need additional security integrating into your storage systems to protect high-value collections, we can make it happen. Whatever your unique requirements, we can work with you to find the perfect solution. Art racks maximize storage space through innovative storage methods that allow artwork to be stored on both sides of the rack, instantly doubling your storage capabilities. Where required, they can be fully integrated with mobile shelving solutions. We offer custom storage cabinets that employ state-of-the-art technologies to control storage conditions including humidity and temperature, ensuring precious documents and artifacts are fully protected at all times. If your facility is bursting to the brim, storing items at off-site facilities may represent a viable solution. Our mobile high-bay storage systems can help you to develop new storage areas while also ensuring that all precious artifacts are fully protected. We understand that the paintings, artifacts, and documents that are stored in museums and galleries are precious and irreplaceable, and that conservation, preservation, and security are major concerns when developing and implementing storage options. 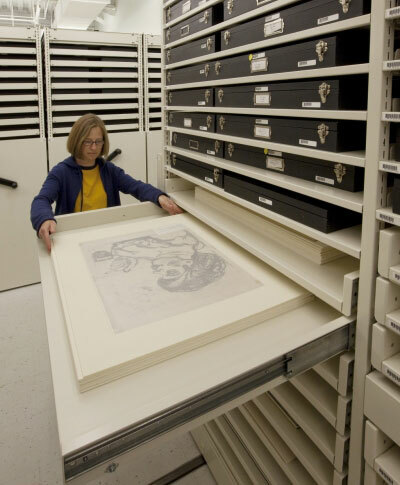 Our experts can work closely with you to develop custom storage solutions that are 100% tailored to the unique needs of your museum or art gallery. Contact one of our storage experts now for a free space assessment.